خلیلی, سیدمحمدرضا, اکبری, طیبه. (1397). مطالعه کمانش استاتیکی پوسته استوانه‌ای کامپوزیتی تقویت‌شده با آلیاژ حافظه‌دار به روش تجربی. علوم و فناوری کامپوزیت, 5(4), 551-564. سیدمحمدرضا خلیلی; طیبه اکبری. "مطالعه کمانش استاتیکی پوسته استوانه‌ای کامپوزیتی تقویت‌شده با آلیاژ حافظه‌دار به روش تجربی". علوم و فناوری کامپوزیت, 5, 4, 1397, 551-564. خلیلی, سیدمحمدرضا, اکبری, طیبه. (1397). 'مطالعه کمانش استاتیکی پوسته استوانه‌ای کامپوزیتی تقویت‌شده با آلیاژ حافظه‌دار به روش تجربی', علوم و فناوری کامپوزیت, 5(4), pp. 551-564. خلیلی, سیدمحمدرضا, اکبری, طیبه. مطالعه کمانش استاتیکی پوسته استوانه‌ای کامپوزیتی تقویت‌شده با آلیاژ حافظه‌دار به روش تجربی. علوم و فناوری کامپوزیت, 1397; 5(4): 551-564. در این پژوهش به مطالعه کمانش استاتیکی پوسته استوانه‌ای کامپوزیتی تقویت‌شده با آلیاژ حافظه‌دار به صورت تجربی پرداخته شده است. سازه کامپوزیتی مورد نظر از جنس کربن اپوکسی می‌باشد که بصورت چهار لایه به روش رشته‌پیچی با دو لایه‌چینی مختلف +55˚/-55˚/SMA/+55˚/-55˚ و +75˚/-75˚/SMA/+75˚/-75˚ ساخته شده است، سیم‌های حافظه‌دار از نوع سوپرالاستیک انتخاب شده‌‌اند که در لایه میانی در دو حالت، با پیش‌کرنش 5% و بدون پیش‌کرنش چیده شده‌اند. کلیه آزمون‌های کمانش استاتیکی بر روی پوسته استوانه‌ای کامپوزیتی توسط دستگاه یونیورسال 2.5 تنی، تحت فشار محوری با نرخ بارگذاری 0.1mm/min انجام شده است. 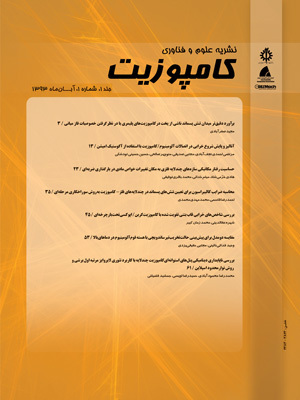 در آزمون کمانش نمونه‌های کامپوزیتی تقویت‌شده با سیم‌های سوپرالاستیک و نمونه‌های بدون سیم، دو نوع شرایط مرزی بررسی شده‌است؛ یکی تکیه‌گاه دو سر گیردار و دیگری تکیه‌گاه دو سر مفصل. همچنین جهت استخراج خواص مکانیکی پوسته کامپوزیتی آزمون‌های استاندارد متعددی شامل آزمون کشش رزین، آزمون کشش مکانیکی حلقه نول، آزمون کشش نمونه‌های استاندارد کامپوزیتی تک جهته و آزمون کشش سیم حافظه‌دار سوپرالاستیک انجام شده است. نتایج آزمون‌های کمانش نشان می‌دهند وجود سیم حافظه‌دار سوپرالاستیک باعث افزایش ظرفیت تحمل بار بحرانی کمانش در پوسته کامپوزیتی می‌گردد. از سویی دیگر در لایه‌چینی با زاویه 75 درجه نسبت به 55 درجه، سازه کامپوزیتی بار کمانشی بیشتری تحمل می‌کند. همچنین در شرایط مرزی دو سر مفصل بار بحرانی کمانش بزرگتر از حالتی است که شرایط مرزی پوسته بصورت دو سر گیردار باشد. In the present work static buckling behavior of laminated cylindrical composite shells were investigated experimentally. The laminated composite shells were fabricated from carbon-epoxy composite by filament winding process. The stacking sequences were +55˚/-55˚/SMA/+55˚/-55˚ and +75˚/-75˚/SMA/+75˚/-75˚. The superelastic SMA wires placed between plies 2 and 3 of the four layers laminate. Shape memory alloy wires were used in the middle of the composite in two cases, without pre-strain and with 5% pre-strain. All of buckling test were performed using 2.5 ton universal test machine with crosshead speed of about 0.1 mm/min. The buckling tests were arranged with two kinds of boundary conditions, simply supported- simply supported and clamped- clamped boundary conditions. Several tests were done to achieve the mechanical properties of composite shells, like standard tensile test of the resin samples, mechanical tensile test of the nol ring, tensile test of the unidirectional composite samples and the tensile test of the superelastic shape memory alloy wire. The experimental buckling analyses of the cylindrical composite shells with embedded superelastic SMA wires show that the critical buckling load increased by using the SMA wires. Also, in the laminated composite with stacking sequences +75˚/-75˚/SMA/+75˚/-75˚, the buckling load of shells was increased. In addition the buckling capability of composite shells in the simply supported- simply supported boundary condition is greater than the clamped- clamped boundary condition. Lee, H. J., Lee, J. J. and Huh, J. S., “A Simulation Study on the Thermal Buckling Behavior of Laminated Composite Shells With Embedded Shape Memory Alloy(SMA) Wires,” International Journal of Composite Structures, Vol. 47, pp. 463-469, 1999. Asadi, H., Kiani, Y., Shakeri, M. and Eslami, M. R., “Exact Solution for Nonlinear Thermal Stability of Hybrid Laminated Composite Timoshenko Beams Reinforced with SMA Fibers,” International Journal of Composite Structures, Vol. 108, pp. 811-822, 2014. Rogers, C.A., Liang, C. and Lia, J., “Structural Modification of Simply Supported Laminated Plates Using Embedded Shape Memory Alloy Fibers,” International Journal of Computer and Structures, Vol. 38, pp. 569-580, 1991. Khalili, S.M.R., Shokuhfar, A., Ashenai Ghasemi, F. and Malekzadeh, K., “Dynamic Response of Smart Hybrid Composite Plate Subjected to Low-Velocity Impact,” Journal of Composite Material, Vol. 41, pp. 2347-2370, 2007. Ostachowicz, W., Krawczuk, M. and Zak, A., “Natural Frequencies of a Multilayer Composite Plate with Shape Memory Alloy Wires,” Journal of Finite Elements in Analysis and Design, Vol. 32, pp. 71-83, 1999. Ostachowicz, W., Krawczuk, M. and Zak, A., “Dynamics and Buckling of a Multilayer Composite Plate with SMA Wires,” International Journal of Composite Structures, Vol. 48, pp. 163-167, 2000. Lee, H. J., Lee, J. J. and Huh, J. S., “A Simulation Study on the Thermal Buckling Behavior of Laminated Composite Shells with Embedded Shape Memory Alloy (SMA) Wires,” International Journal of Composite Structures, Vol. 47, pp. 463-469, 1999. Lee, H. J. and Lee, J. J., “ A Numerical Analysis of the Buckling and Post Buckling Behavior of Laminated Composite Shells with Embedded Shape Memory Alloy Wire Actuators,” Journal of Smart Materials and Structures, Vol. 9, pp. 780-787, 2000. Roh, J. H., Oh, l. K., yang, S. M. and Han, J. H., “Thermal Post Buckling Analysis of Shape Memory Alloy Hybrid Composite Shell Panels,” Journal of Smart Materials and Structures, Vol. 13, pp. 1337-1344, 2004. Panda, S.K. and Singh, B.N., “Thermal Post Buckling Analysis of Laminated Composite Spherical Shell Panel Embedded with Shape Memory Alloy Fibers Using Non-Linear Finite Element Method,” Journal of Mechanical Engineering Science, Vol. 224, part C, pp. 757-769, 2009. Thompson, S. P. and Loughlan, J., “Enhancing the Post Buckling Response of a Composite Panel Structure Utilising Shape Memory Alloy Actuators, a Smart Structural Concept,” International Journal of Composite Structures, Vol. 51, pp. 21-36, 2001. Khalili, S.M.R., Botshekanan Dehkordi, M. and Carrera, E., “A Nonlinear Finite Element Model Using a Unified Formulation for Dynamic Analysis of Multilayer Composite Plate Embedded with SMA Wires,” International Journal of Composite Structures, Vol. 106, pp. 635-645, 2013. Thompson, S.P. and Loughlan, J.,“Adaptive Post Buckling Response of Carbon Fiber Composite Plates Employing SMA Actuators,” International Journal of Composite Structures, Vol. 38, pp. 667-678, 1997. Thompson, S.P. and Loughlan, J., “The Control of the Post Buckling Response in Thin Composite Plates Using Smart Technology,” Journal of Thin-Walled Structures, Vol. 36, pp. 231-263, 2000. Standard Test Method for Tensile Properties of Plastics, Annual Book of ASTM Standard, 08.01, D 638, 2014. Standard Test Method for Tensile Properties of Polymer Matrix Composite Materials, Annual Book of ASTM Standard, 15.03, D 3039, 2014. Standard Test Method for In-Plane Shear Response of Polymer Matrix Composite Materials by Tensile Test of a 45° Laminate, Annual Book of ASTM Standard, 15.03, D 3518, 2013. Failure Analysis of the Split-D Test Method, Annual Book of ASTM Standard, STP 617, 1977. Hndgkinsun, I. M., “Mechanical Testing of Advanced Fibre Composites,” Wood head publishing limited, Cambridge, pp.100-103, 2000.
 yousefzadeh, M., Taghavian, S. H., Shokri, A. R. and Eskandarijam, J., “Filament Winding, It’s Development, Manufacture, Applications and Design,” Translated in Persian, First ed., Arna Publishing Company, Tehran, pp. 262-268, 2014. Standard Test Method for Tension Testing of Nickel-Titanium Superelastic Materials, Annual Book of ASTM Standard, 13.02, F 2516, 2014. Lim, K., Li, X and Guan, Z., “Optimal Design of Advanced Grid Stiffened Composite Cylindrical Shell,” Journal of Applied Mechanics and Materials, Vol. 330, pp. 681-686, 2013.